As the semiconductor industry approaches the point where High-K dielectrics will be necessary, a number of challenges will occur. One problem is the performance of the gate connection. It will be necessary to use a metal or metal-like gate material in order to achieve the necessary performance. Traditional heavily-doped polysilicon will not provide the control and performance necessary. Currently, the leading approach to fabricating a metal gate is called FUSI (pronounced "foo-see," short for fully silicided gate), which is basically an extension of existing processes. Silicides are already used on top of the source, drain, and gate to improve resistance and provide a better interface between the silicon. Silicides are formed by depositing a metal, such as titanium, nickel or cobalt, on top of the silicon, followed by a thermal step (usually rapid thermal processing) to create a silicide, such as TiSi2, CoSi2, or NiSi. In the FUSI approach, this step is simply continued until all of the gate silicon is converted to a silicide. There are two approaches to metal gates: depositing the metal gate first, or depositing the metal gate last. FUSI falls into the second category. At this time, there is not a preferred approach, although engineers are working to make the thermal processing temperatures as low as possible. The winner is likely to exhibit the best combination of device performance, reliability, and simplicity in processing. Give our Online Training a try – for free. 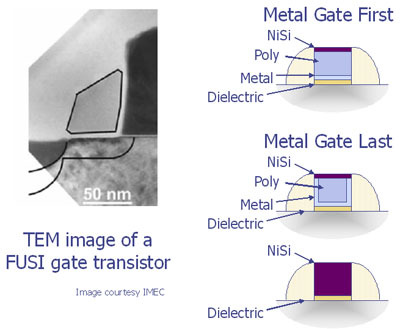 This month's topic is Micro BGA: Lead Frame Preparation. Semitracks, along with Semiconductor International, have put together a 2-day course on Semiconductor Process Integration for CMOS and BiCMOS Technologies. Dr. Badih El-Kareh of Texas Instruments will give an overview of the process integration challenges associated with today's advanced semiconductor devices. Dr. El-Kareh will cover passive and active components, contact and interconnect issues, isolation technologies such as STI and SOI, transistor integration issues, as well as full CMOS, BiCMOS and High-Speed Bipolar Process Integration techniques.